ROSEWOOD: It very much felt like a 2007 USA Network series. (Man, remember when USA Network was all about the “blue skies” mentality?) That’s not a bad thing, per se, but it is what it is. Morris Chestnut is charming, and the supporting cast is great, but I kind of feel like this might end up being a DVR/Hulu show unless the next episode or so massively grabs me. THE GOLDBERGS: Oh my God, Sean Giambrone (Adam) is growing up. Aside from that, the RISKY BUSINESS bit was fun, but very little can top Beverly Goldberg’s delightful brand of cursing. 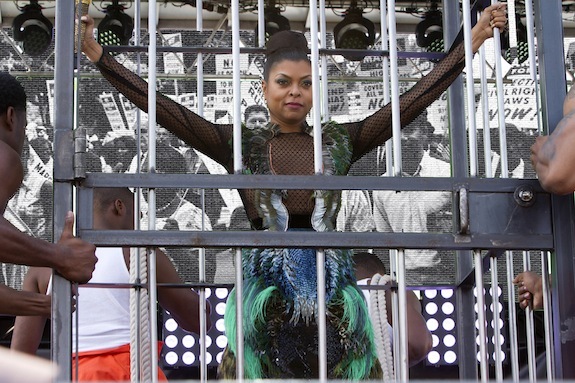 EMPIRE: Did not crazy-love the premiere. Not entirely sure what I wanted from it — maybe more music from the core cast? — but it was just fine. The best/worst scene was the end as Jamal threw Cookie out. Their relationship was one of my favorite parts of EMPIRE’s first season, and my God, the expressions on their faces as Jamal threw her out destroyed me. So was Jamal’s brief crack in his demeanor after he shut the door…until he quickly tried to pull it together. MODERN FAMILY: Um, I want Phil’s “Oy Vey” shirt so much. Solid premiere aside from that. I’m curious how long the writers will play with the Haley/Andy will they/won’t they dynamic — I thought that it might come to an end (one way or the other) with the cliffhanger for last season, but it seems like they’re doubling down on it.